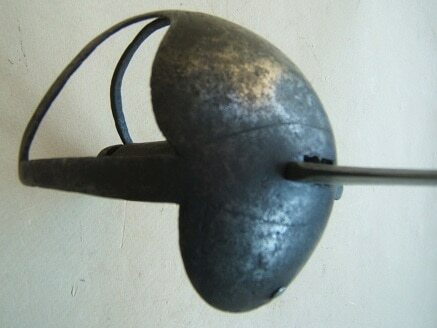 A VERY GOOD CARLOS IV MARKED SPANISH-COLONIAL AMERICAN PERIOD CAVALRY SWORD (HANGER), ca. 1780: In overall very good untouched condition. “C. IV.”/DLa. (Charles IV) and unit marked, 33 1/4″, single edge, straight blade with its original cutting edge and a reinforced back. 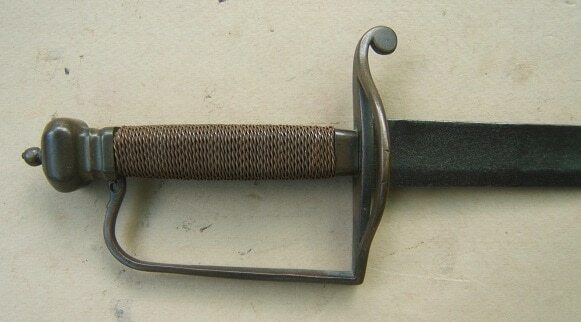 Spanish Colonial-American made sheet-steel hilt with a turned ball-type capstan-form pommel, an integral, pierced, triple-bar/slotted, basket-type knuckle-guard and a rounded cross-guard with a slightly curved upper quillion. Rounded wooden (walnut?) grip-scales (possibly working-life replaced) with a dark brown age patina, some scattered handling marks and 55%+ finish. In overall very good untouched condition. The blade retains its original, cutting edge with generally smooth gunmetal-gray surfaces, some scattered discoloration and areas of pitting. A visible Charles/Carlos IV marking and an even age patina. Very good+ hilt with matching untouched, steel surfaces: of typical sheet-steel, Spanish-Colonial design. 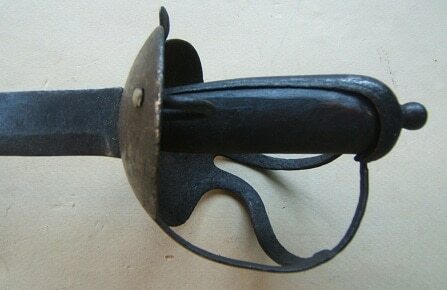 A very nice example of a Classic Spanish Colonial Cavalry Sword, ca. 1780. 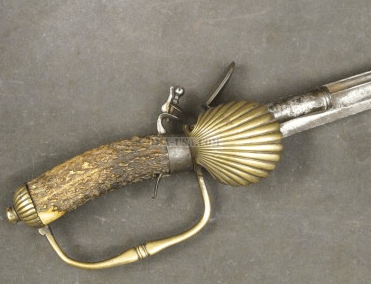 For similar examples, please see Brinckerhoff’s & Chamberlain’s: “Spanish Military Weapons in Colonial America, 1700-1821”, Fig. 153 & 154 & G. C. Neumann’s: “Swords & Blades of the American Revolution”.